You are here: Home / Jewelry / Bracelets / Sparkly gift guide: $200 – $500. Sparkly gift guide: $200 – $500. Things are heating up: today’s gift guide features jewelry from $200 – $500. This are easier for me to resist, since buying one of these would be a significant disruption to my finances. That doesn’t make them any less enjoyable to look at, however. And they would all be lovely keepsake presents to someone very special from someone who can afford to spend a little extra. For options at different price points, please see my past gift guides: under $25, $25-$50, $50-$100, and $100-$200. A funky and yet still classic pair of earrings. These are glamorous in the extreme. Also owned by the incomparable first lady of fabulousness, Michelle Obama. against an LBD or similarly simple outfit. 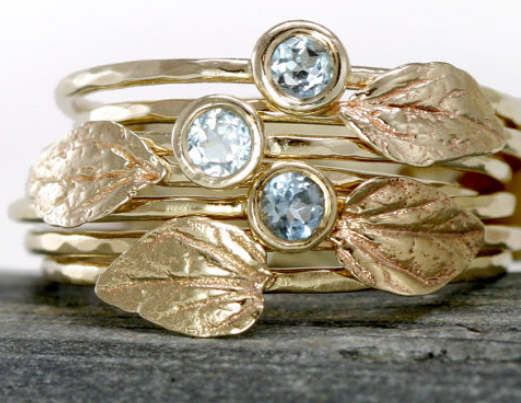 with their hammered gold, the shine of the aquamarines, and the delicacy of the veined leaves. Tiny shiny bows! I would wear this so often. These are exceptionally beautiful. The mixed metals, the delicacy of the stylized feathers…I swoon. I have trouble breathing when I look at this pendant. So intricate and beautiful. simplicity too much not to feature it again here. Not only are these beautiful, unique, and made from very high-quality stones, they’re convertible. You can rearrange the stones to make 6 different pairs of earrings. It’s a bejeweled headband. A bejeweled headband, do you hear me? Probably horribly uncomfortable, but I bet it’s worth it. dripping in jewels.. my favorite way to spend the night out!! love this!